"There are no shortcuts in evolution." Louis D. Brandeis once stated. This quote may not have been directed towards mesh grilles, but we can apply it to the high quality of the Paramount Evolution grilles. Each grille is constructed with stainless steel and finished with a durable black powder-coat. Manufactured from a sturdy woven mesh you better believe your front end will be protected from debris and bugs. It can be difficult at times to make something look unique, so let us help you. By adding an Evolution grille, you don't have to worry about figuring out how to make your ride look fantastic. Installing one of these will surely turn heads. Showcasing chrome perimeter rivets really make the grilles stand out from other vehicles. You can also choose whether you want one with or without the shell. That way you can get the customization that is just right for your style. Backed by a 3 year warranty, each Paramount Evolution grille is made to last. Don't make the wrong choice by choosing another grille or going another day with a lame front end. Evolve with the times and get this kick-arse grille installed today! 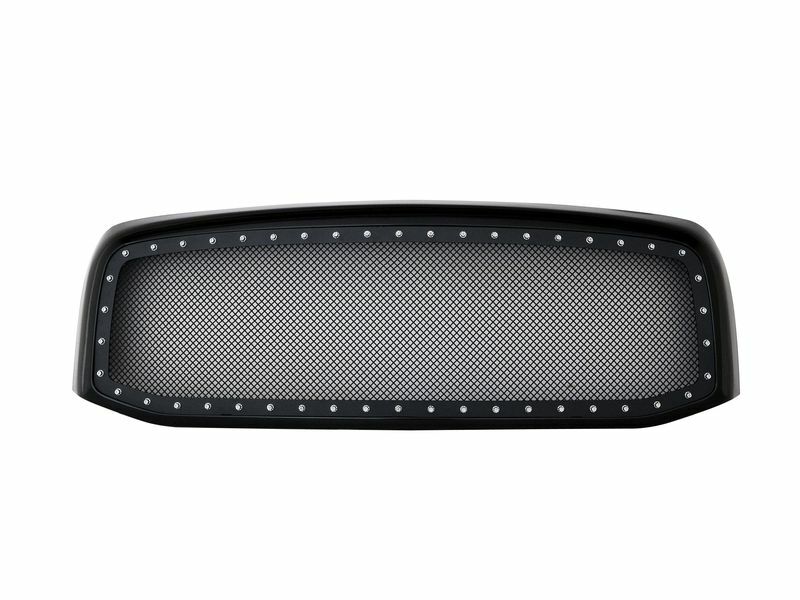 Mesh Grille Insert: Uses factory shell, requires cutting out your factory grille. Your Evolution mesh grille is backed by a 3 year warranty. That means if things seem to not be 100% for you give us a call at 877-216-5446. Paramount Evolution grilles are a great addition to your front end. Depending on your vehicle you can get an insert, overlay, or complete replacement. If you are on the struggle bus with installing these give us call at 877-216-5446.